The strange things that go on inside of Finklestein's lab are always so... well, bizarre. He creates wives for himself, (probably because he's so horrible to be around and no one can stand him, but that's beside the point) and Sally was his greatest creation. It's easy to see why he was so proud of her! She's made of different parts that were stitched together and then she was stuffed with dry leaves, yet she's still clever, cute, and goal-oriented. Sally desperately wanted to escape Finklestein's possessive clutches and she did! She poisoned his soup with deadly nightshade and then leaped out the window. Yup, she's pretty much the coolest most courageous rag doll that we know. And she snagged Jack Skellington, the Pumpkin King, as her boyfriend. She's basically the most awesome doll that has ever been sewed together, so it's easy to see why girls want to dress as the daring doll from The Nightmare Before Christmas. This Sally costume will transform girls into Tim Burton's classic character. 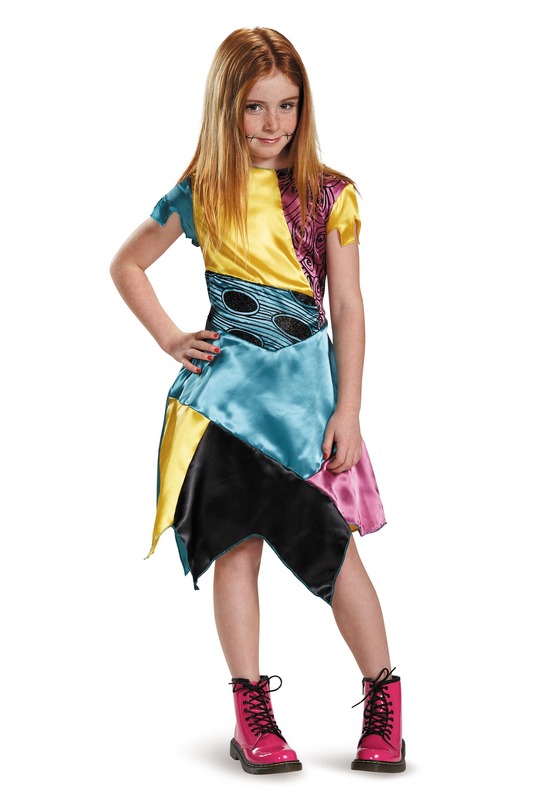 With a tattered patchwork dress that is made of shiny aqua, magenta, black, and yellow fabric, she'll look just like the determined redhead. Add some fake stitches to her face with an eyeliner pencil and she'll be ready for a visit to Halloween Town!